Myssie came back from the beach with a perfect sand dollar, a gift for Susan. We swam back to our favorite little corner of White Bay this morning, and the sunlight was hitting all of our little fish and coral friends just right. There’s a very large boulder here, about the size of a moving van. All around it, reef life has sprung up, and we have been returning year after year to this amazing underwater garden. As we swim around it, there’s a narrow and shallow swim-through between boulders that you have to time just right or risk getting scraped on the rocks. It’s a lesson in patience and faith in the swimming guides to get it right. As you exit the swim-through, you’re treated to a dazzling blue pool filled with colorful fish and coral. It’s exhilarating and achingly beautiful. We swam around the rock several times before continuing on our swim. A very large southern stingray snuck up on us, swam 4 inches beneath Heather, circled our group, then swam off into the depths. We’ve seen this type of behavior before from rays before. I think they’re just curious. Weather plays a big role in how we plan our days and our week. This week we’ve had a north swell of up to 8 feet, with the tradewinds a gusty 10-15 knots from the east-northeast. The swell, which is forecasted to subside today, kept us in the southern portion of the archipelago for the first few days of the trip, and somewhat limited our swims. The wind we can deal with easily, as there are lots of calm harbors in the lee of these splotch-shaped islands. After our morning swim, Captain Jason moved Rumba to Haulover Bay on Cooper Island. It’s a beautiful and private little spot just out of sight from a large marina, where we could restock our ice stores but stay away from the noise and the lights. 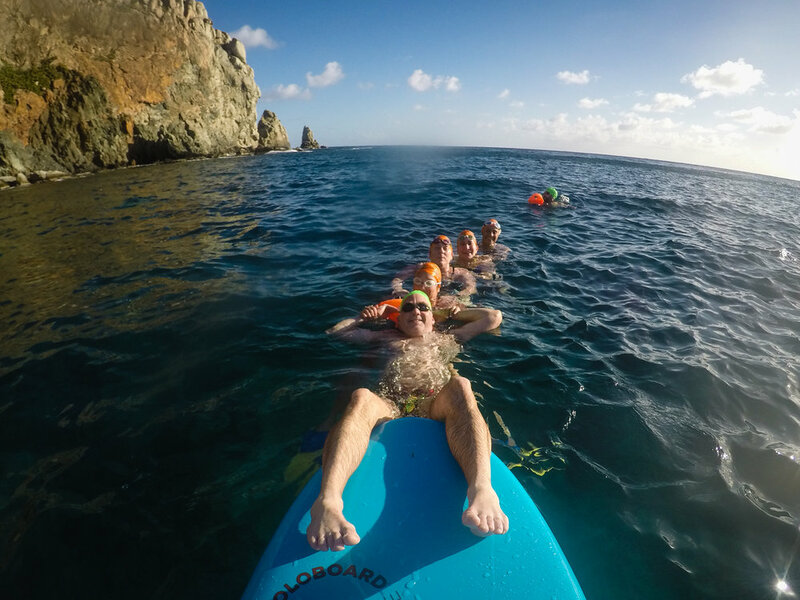 Many of our guests jumped in to snorkel and splash around. A nurse shark was sighted. Lots of blue tang and tarpon. Schools of bar jacks chased little silversides right out of the water, where two frigates flew down to snack on them. A National Geographic special right off our stern. Later, we swam along the steep cliff here. Rick and Karen swam together. Miriam, after only 2 days of open water swimming, is now a sea queen, charging into the waves. One thing about all of our guests this week is that the swim very straight. I’d like to credit my brief navigation clinic this morning, but it’s more likely they’re just naturally good navigators. Spontaneous marine conga line on our Cooper Island swim. Pina Coladas greeted our guests back aboard Rumba, which I still mistakenly refer to as Promenade at least once a day. Chef Miriam somehow produced a dinner of very flavorful Shrimp n Grits. Still-warm macaroons paired nicely with a glass of wine. Yikes we are running out of Pinot Grigio! Sunset from our overnight spot at Cooper.